Cookshop is a wonderful, unique restaurant that deserves to be as busy as it is. Unfortunately, it the being busy that can make it a little unpleasant, as it gets very crowded and noisy. The food is interesting, and the menu varied. All the dishes we tried were fantastic. Service is professional and friendly and the atmosphere is large, airy and, simply un-New York, in a good way. I have a feeling that Cookshop does a great breakfast, so that is now on our list to try. Dessert may be hit or miss but everything else was simply great. Try the Lamb tasting or duck samosas. Loaded with light wood, gleaming white tabletops, and an downright elegant spaciousness, Cookshop looks like it belongs more in the Northern California wine country that on the outskirts of Manhattan's bustling Chelsea. Still, it's open and airy presence is nothing less than refreshing in a world where cramped, dark and cloistered is the norm. Dressed beautifully for Christmas, Cookshop was covered from head to toe in large wreathes, lights, and heavy garlands of evergreen that filled the space with the wonderful smell of the season. But the decorations which, in other venues, could seem obtrusive, kitschy, or oppressive here seemed perfectly light, sensuous, and serene. Tables are dressed simply but elegantly with silver and glassware and a small dash of color in the form of a pepper mill. Small wooden bowls hold a dash of course salt, a nice change from the regular shaker. Small kerosene lamps light up the tables with a soft glow. The one thing that mars the serene California-esque atmosphere is that Cookshop is, not surprisingly, very busy, and when it fills up it can get very, very noisy. 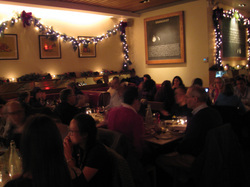 Be prepared by coming during off hours, either early or late, or by requesting a quiet table with your advance reservation. If you sit anywhere near the bar prepare to shout to be heard. Or, have so many cocktails that you simply don't care. Service was excellent and very professional while still being friendly and down-to-Earth. Our server got a little less-available as it got busier, but that is to be expected. 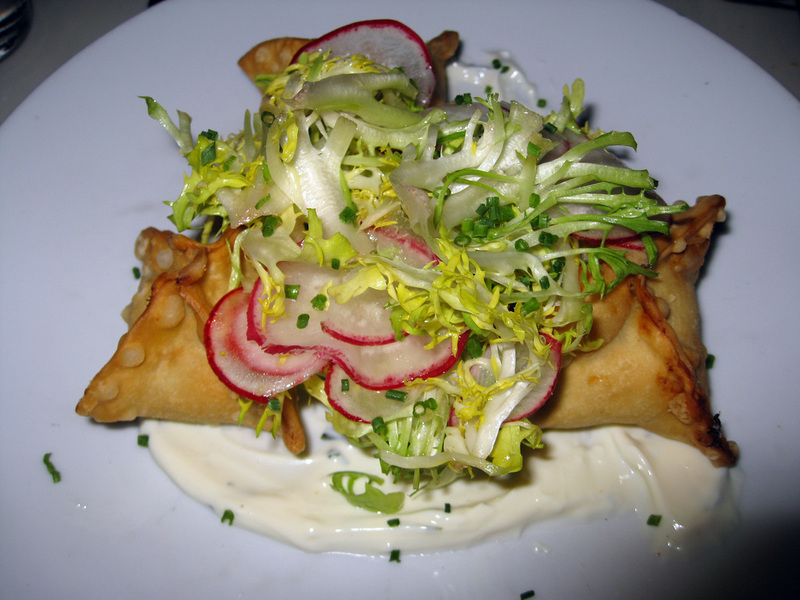 The menu at Cookshop is varied and interesting, making it difficult to choose what to have. 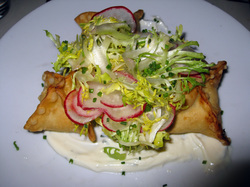 To start, we had duck confit samosas with minted yogurt sauce, orange oil, and cilantro ($12). the samosas were freshly-fried and very hot. The dough was crusty and crisp and the duck was spicy. The cool yogurt was a perfect contract and the fresh cilantro offered a bit of Spring-y freshness. 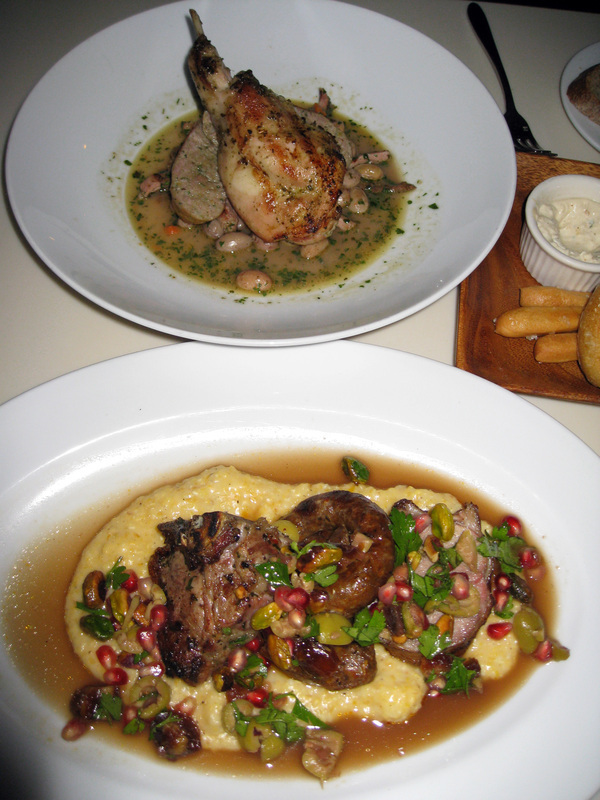 For entrees we chose an amazing lamb tasting ($28) with a very spicy lamb sausage, and two pieces of grilled lamb which sat on a bed of creamy polenta with pomegranate seeds, dates, olives, and pistachios, making a dish that was at once crunchy, sweet, salty, and spicy. It was the most unusual and delightful dish! We also ordered a rabbit duo with rabbit sausage and rabbit leg in a warm, earthy broth with broad beans, ham and chanterelles. Both dishes were incredibly fresh, unique, and delicious. To accompany the food a nice wooden tray is brought, with whole grain bread, crunchy breadsticks, and a nice crusty ciabatta roll. The bread came with a light horseradish cream, though I would have preferred a simple, great butter. The dessert menu was not as tempting as the regular menu. I struggled to find something I would like and finally chose a pear and quince tarte tartin with walnut ice cream ($7). The crust of the tarte was beautifully flaky and buttery, but the filling was flat and uninspiring and not sweet enough. The walnut ice cream had a weird and unpleasant flavor. Coffee was good and came with warm milk. Cookshop has a nice specialty cocktail menu and full bar. Immaculate. Bathrooms are very nice and, on the way, you get a nice view of the open kitchen. Beautiful, California-style décor, interesting menu and fantastic food, and excellent and friendly service. Can be very noisy, dessert was disappointing.